I have thrown away far too many overripe avocados in my life. I feel bad about this, but it happens. I've come to terms with it. Just like retail outlets build a theft loss into their budgets, I build in an avocado loss. Because the thing with avocados is that they exist on their own schedule. You can't rush them, and when they're ready, you'd better be freaking ready, too. I eat avocado almost every single day. I've recently fallen in love with these little avocados called Gator Eggs. They're small--about half the size of a regular Hass avocado, and the perfect little single serving. They sell them in packs of six, and usually ripen beautifully one or two at a time, so I can get through a whole week of them. But this week, the alligator eggs were *not* cooperating. I was waiting and waiting and waiting, but they were all rock hard, until suddenly they were all ready. All of them. AT THE SAME TIME! Anyway, this pasta. A creamy sauce with hints of fresh mint and spice from garlic and red chiles. Eugene loved this stuff. 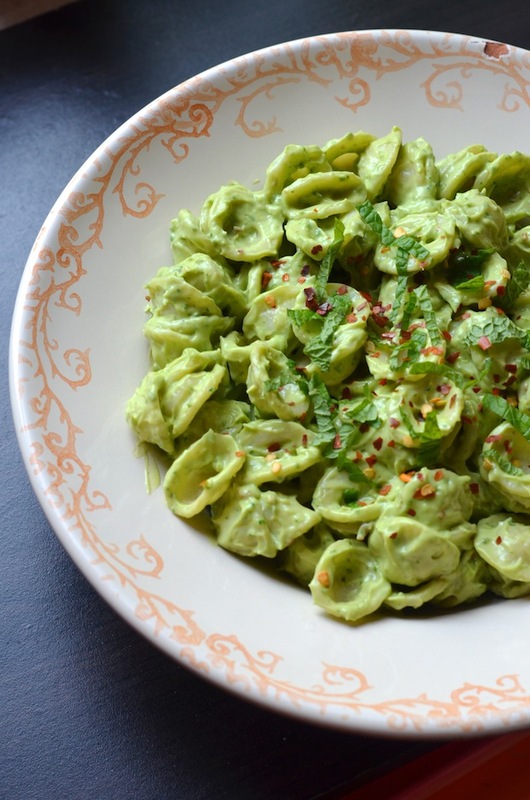 He called it guacamole pasta, but I think the mint makes it less guacamole-ish than actual guacamole. It's creamy, it's dairy-free, and it's very, very good. Give it a try soon, because time and tide and avocados and babies-about-to-be-born [I assume] wait for no [wo]man. Disclaimer: please note that despite all the childbirth references above, the only thing I'm pregnant with is ideas. Bring 4 quarts of salted water to a boil, and cook pasta according to package timing for "al dente." 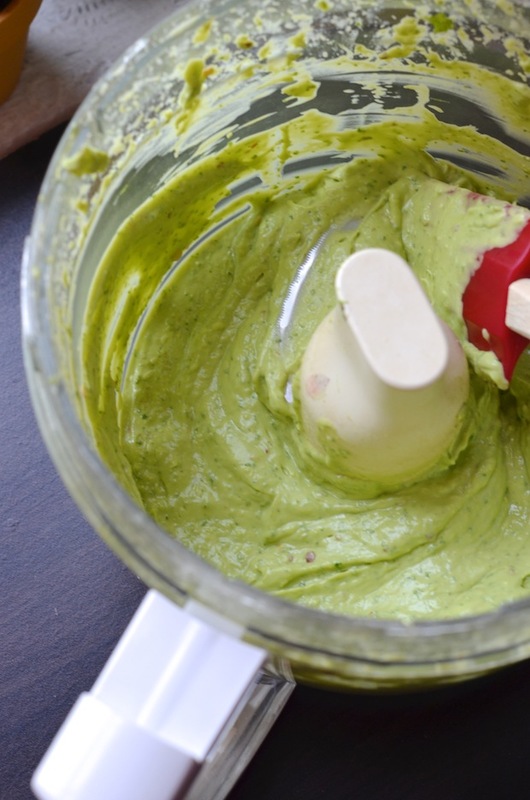 While the pasta cooks, prepare the sauce: In a food processor or blender, combine the avocados, mint, garlic, lime juice, olive oil, water, and chile flakes, if using. Puree until very smooth, adding a tiny bit more warm water a tablespoon at a time if it is too thick. You're looking for a sauce with the consistency of a loose mayonnaise. Season with kosher salt and puree again to combine evenly. Add the sauce to the cooked and drained hot pasta and toss to coat. Divide into plates and garnish with a bit of fresh mint and a pinch of chile flakes.